This period encompassed three major wars that disrupted the German economy, particularly affecting manufacturing. Welz’s company suffered heavy losses and he was obliged to shut it down. He looked across the Atlantic to the United States and concluded that this country offered more opportunity for him and his family. In 1857 he had married Maria Theresa Goepfert, known as “Theresie” throughout her life. The next year a daughter, Marie Theresa, was born. She would be an only child. In 1874 Welz packed up and left Germany with his family. Philadelphia. Welz’s first stop on his American journey was in the City of Brotherly Love. He carried with him letters of introduction from prominent citizens of Berlin, one of them to the banking house of Drexel & Company. The bank offered him the money to buy a stake in a failing Philadelphia woolen mill and thereafter manage it. After surveying the prospects, Welz wisely rejected the opportunity finding that only one of 400 mill employees spoke German and he at the time spoke no English. Instead he accepted a lesser job with the Public Ledger newspaper supervising their newsboys. Ever frugal, Welz in time saved enough money to buy a restaurant, where he soon found he had a particular ability in providing food and drink. After three years of running his restaurant he had saved $10,000, equivalent to $250,000 today, and looked around to buy a hotel. Indianapolis. He found one in Indiana in 1878, purchasing the Circle Park House in Indianapolis, a leading hostelry and favorite of circus folks. Although Welz spent only four years in Indianapolis, they proved to be pivotal in two ways. They launched him on a career in the hotel business and he met Dr. Christian Fry, who would become his son-in-law and business partner. 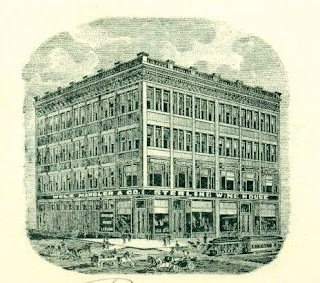 Fry, a native of New York, had come to Indiana as a farm worker, studied medicine, practiced in for a time, and then opened a pharmacy in Indianapolis. The two met when Fry wooed and later married Welz’s daughter Marie Theresa. While in Indianapolis, Welz, now speaking English with some facility, became a naturalized citizen. From a passport we have a description of his appearance in middle age: dark brown hair; swarthy complexion; high forehead; broad face, nose and chin, full mouth and gray eyes. 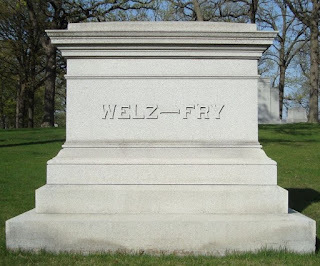 After three years of running the Circle Park House, in 1882 Welz, always looking for a better opportunity, sold the property and with his wife, and the young Fry couple, headed north to St. Paul, Minnesota. St. Paul and Hotels. 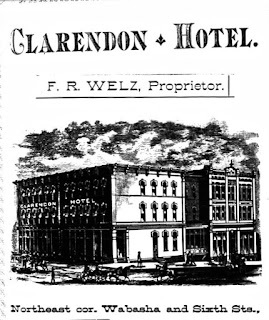 In his new home city, Welz managed Welz Found Wealth in Hotels and Hooch and eventually acquired the Clarendon Hotel at the northeast corner of Sixth and Wabasha. Although that hostelry had proven unprofitable under three previous owners, Welz transformed it into a first class, money-making hotel. 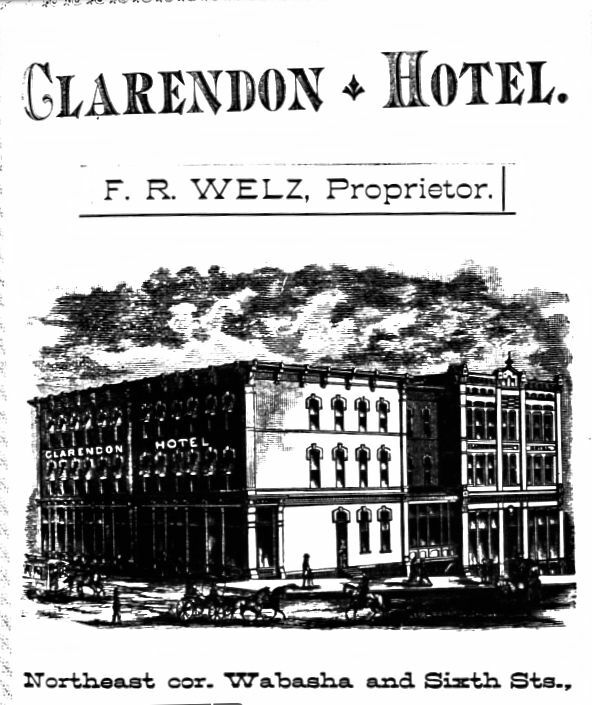 “He brought to the business keen discernment, unflagging enterprise, and a knowledge of the demands of the traveling public….” After three years, however, Welz tired of running the Clarendon, sold it, and took an extended holiday with his wife to Germany. Upon his return, in association with Dr. Fry, who was running a St. Paul pharmacy, Welz brought or, some sources say, leased the Merchants Hotel, shown left. This was a premier property in St. Paul at the corner of Jackson and Third Streets, a popular place for social reunions and political gatherings. Just before the convening of the Minnesota legislature and state conventions the hotel’s rotunda and halls were crowded with politicians and onlookers. As was his usual pattern, after five years of operating the Merchants Hotel, Welz with Theresie in 1892 embarked on another extended trip to Germany, taking the waters at Carlsbad. 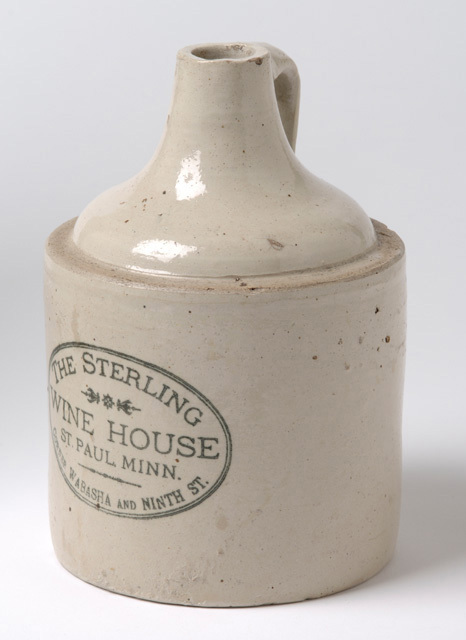 This time he apparently had decided to get out of the hotel business entirely and instead set his sights on St. Paul’s lucrative liquor trade. 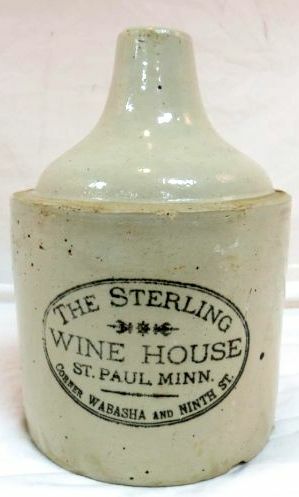 The Sterling Wine House. 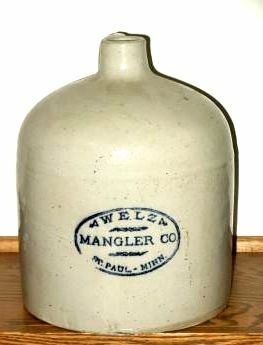 Upon returning Welz took a local businessman, Robert Mangler, as a partner and established a wholesale and retail liquor business called “Welz-Mangler Co., Importers and Jobbers, Wines and Liquors.” Located in a four-story building at 466-468 Wabasha, corner of Ninth St., the facility also housed a saloon called the Sterling Wine House, as shown here in an illustration. The company decanted whiskey received from distilleries elsewhere into its own ceramic containers and peddled them to a range of drinking establishments. In the matter of wooing clientele Welz demonstrated the same good instincts that had served him in the hotel industry. 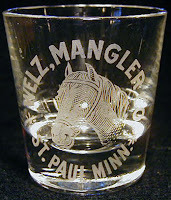 Competition for the business of St. Paul and Minneapolis saloons, restaurants and hotels was keen. 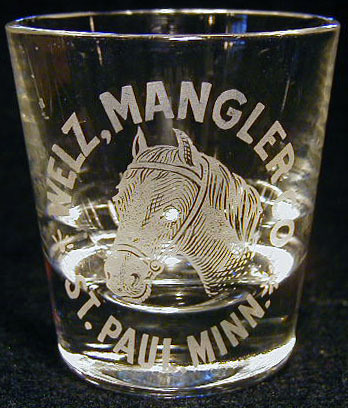 Customer loyalty could be fostered by attractive giveaway items like back-of-the bar bottles and shot glasses advertising Welz-Mangler. Frederick saw to it his clients were well supplied. The Ryan Hotel. 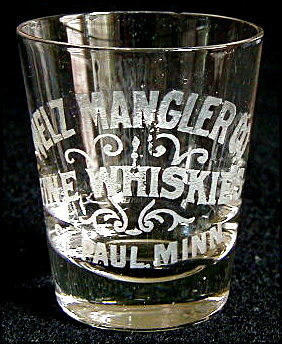 While still involved in the liquor house, Welz’s interest took another turn. 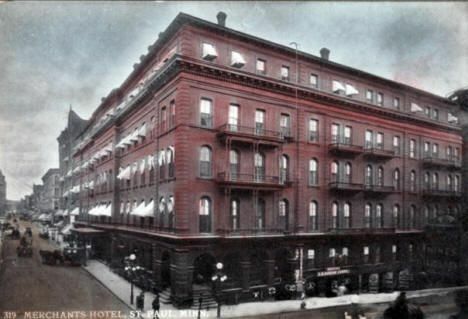 A St. Paul family named Mehls had built and attempted to operate a large luxury hotel called the Ryan. It is shown right. 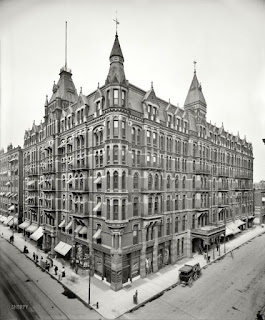 Apparently not experienced at managing such an establishment and facing a economic downturn during the Panic of 1893, the Mehls went bankrupt and a bank repossessed the hotel. Welz, in partnership with Fry, bought it. 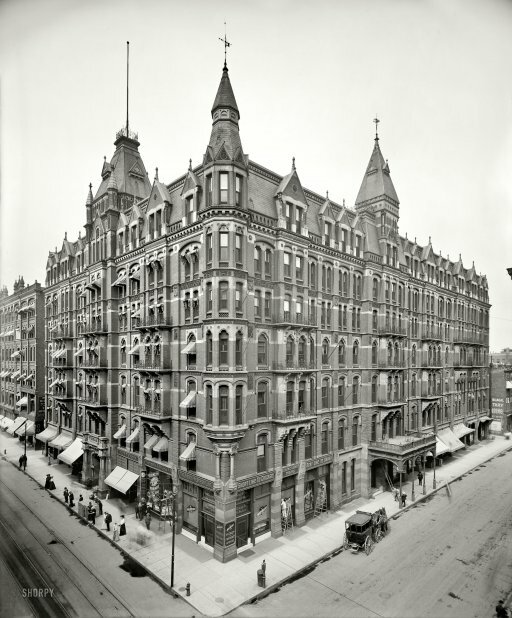 Once again Frederick Welz made money, retiring from running the hotel in 1904 at the age of 71. He continued, however, to be listed as secretary-treasurer of the liquor house and saloon. The Latter Years. Throughout his career, Welz — now referred to as a “capitalist” — had made investments in Minnesota real estate and was considered a leading landowner in Hennepin County. In addition, he had nine grandchildren to hold his attention, the product of the fruitful marriage of Christian Fry and his daughter..
As he aged, Welz traveled to Florida to escape the harsh winters of Minnesota. 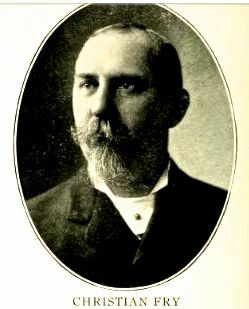 He was in Daytona when he died in February 1910 at the age of 76. The cause given was “a stroke of apoplexy,” meaning either a cerebral hemorrhage or a heart attack. His daughter was by his side in his last moments and arranged for his body to be taken back to St. Paul. 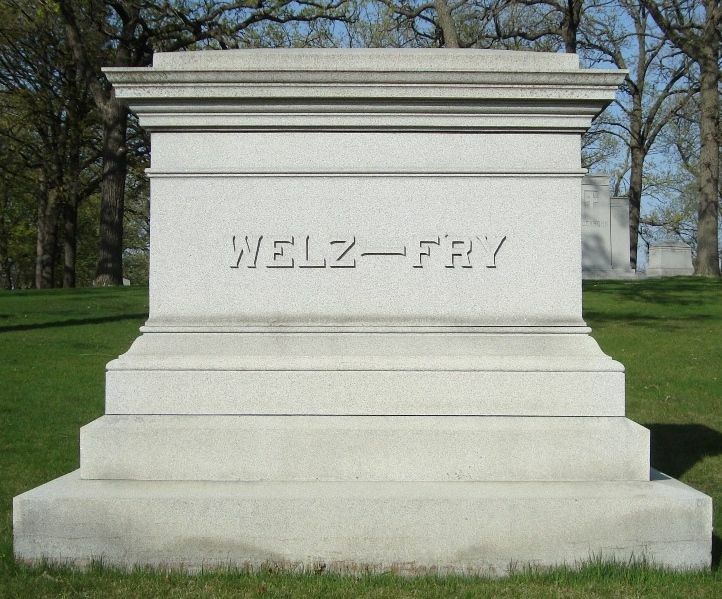 As his family grieved by his graveside, Frederick Welz was interred in Oakland Cemetery next to Theresie, who had died four years earlier. A large plinth marks their individual graves and those of other family members. 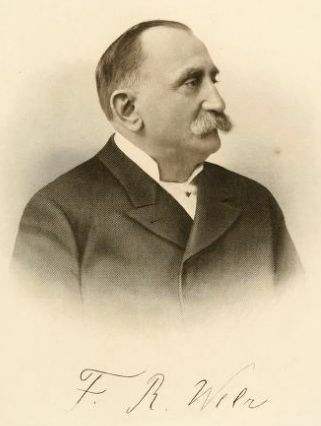 Note: While this post was derived from many sources, of particular value was the two page biography of Frederick Wells to be found in the 1908 book, “Past and Present of St. Paul, Minnesota, Illustrated with Views and Portraits,” by W. B. Hennessy. Except as otherwise indicated, all the italicized quotes are from that volume as is the Welz portrait.